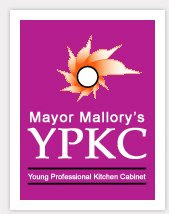 In 2006 Mayor Mark Mallory launched the Mayor’s Young Professional Kitchen Cabinet (YPKC) – the first of its kind anywhere. The goal was to tap into the minds of those young people that so many cities are trying to both retain and attract. Each year one hundred young professionals are tapped from all over the tri-state to volunteer their efforts to help make the Cincinnati region a more welcoming place for young people. The young professionals work on a variety of committees with different focuses. They work within their various committees and then push forth their ideas. If those ideas gain approval from the YPKC as a whole, then they are then directed to the Mayor’s office. The YPKC is a great opportunity to get involved especially if you’re one of those many people who have had that brilliant idea come to you in the middle of the night and think, “boy it would be nice if I had the opportunity to talk to the Mayor about this.” Well you can. You can apply now to be a member of the 2009 YPKC. I was fortunate enough to be a part of the 2008 YPKC as a member of the Transportation Committee. Due to travel plans, a spring graduation and other time constraints I will not be able to once again apply. I do strongly encourage everyone else who is interested to do before the December 3rd deadline (sorry for the late notice).